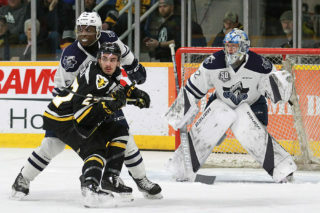 The last round of the Battle of Nova Scotia in the regular season went the way of the Screaming Eagles in a 4-2 victory over the Halifax Mooseheads. 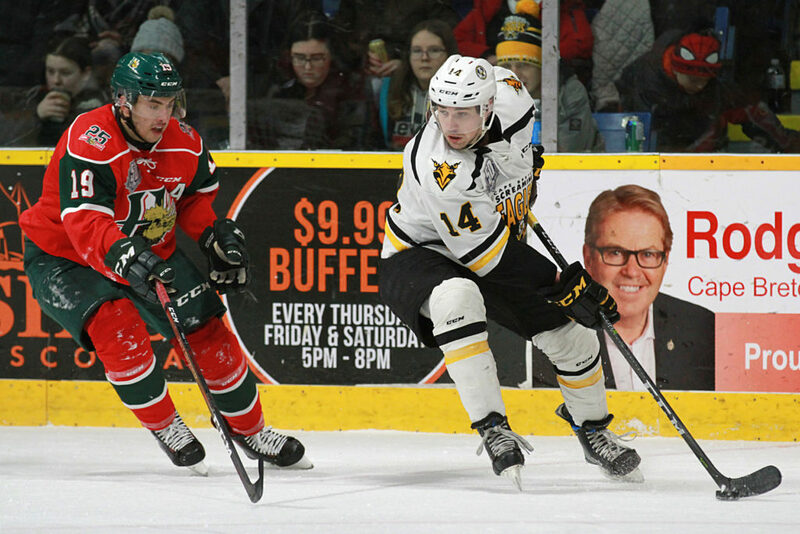 Halifax struck first in the first period, but the Eagles would leave the period with the lead. Antoine Morand opened the scoring for the visitors, tipping a shot past Kevin Mandolese before the four minute mark. Derek Gentile evened the game on a power play, firing a shot from the front of the goal past by Alexis Gravel. The Eagles would earn the lead less than two minutes later. Egor Sokolov won a battle for the puck behind the Halifax goaliine and threw the puck out to Mitchell Balmas, who would ting the twine to put the Eagles up 2-1. At the 4:02 mark of the middle stanza, Shawn Boudrias would push the Eagles lead to 3-1. Boudrias powered his way through the zone and then deked by Gravel to give the Eagles a two goal advantage. Before period’s end, Jared McIsaac pulled one back for the visitors, receiving a pass from a face-off win from Keith Getson and hammering a shot over Kevin Mandolese’s shoulder. Cape Breton held Halifax off in the third period, as the Mooseheads outshooting the Eagles 14-6 failed to yield a tying goal. With 2:22 remaining Halifax coach Eric Veilleux elected to lift Gravel for an extra attacker. Leon Gawanke would fire the puck the entire length of the ice and hit the empty net, making it a 4-2 game. Halifax would pull Gravel again, but couldn’t get any closer. Mandolese picked up the win, stopping 33 of 35 shots. Gravel allowed three goals on 19 shots in addition to the empty netter. The Screaming Eagles now begin a six game road trip through the province of Quebec. It all starts Friday night in Blainville-Boisbriand as the Eagles visit the Armada. Puck drop is at 8 PM Atlantic time, and you can catch all the action beginning with the pre-game show with Patrick McNeil at 6:30 on 1270 AM CJCB or online at www.cjcbradio.com.